In this V+U course we teach selected topics covering a spectrum of the different research areas of the CGV institute. The lecture (V) part comprises a series of lectures on current topics in 3D Modeling and Processing, Simulation and Shape Analysis, Visual-Interactive Data Analysis, and Digital Library Technologies. The lectures are given by members of the CGV institute and guest presenters, and followed by a written or oral exam. In the exercise (U) part, students can chose one from several offered practical assignments in one of the above areas. The exercises are being worked on individually or in a team of students throughout the semester advised by members of the institute. A final presentation and short report on assignment results is the basis for grading the U part. The V and U parts can be taken together or independently of each other. The AKCG lecture and exercise is open for all master and doctoral students interested in the above topics. Previous knowledge in Computer Graphics, Visualization and/or Interactive Systems as well as practical programming skills in a current programming environment is recommended for successful participation. 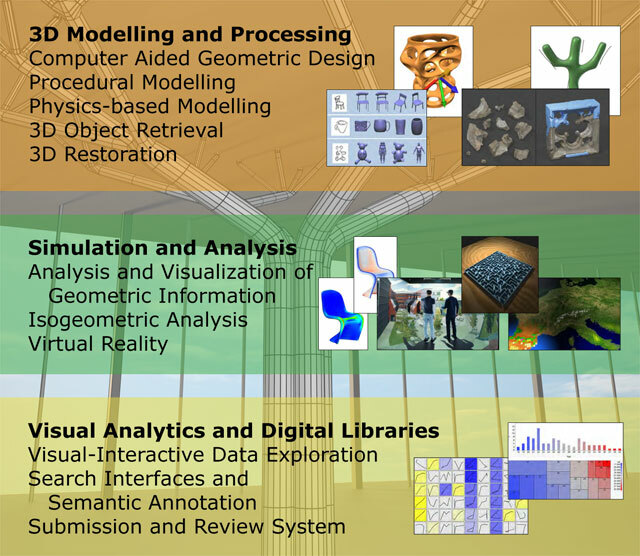 Visual Analytics and Digital Libraries: © T. Schreck, T. Tekusova, J. Kohlhammer, and D. Fellner. Trajectory-based visual analysis of large Financial time series data. ACM SIGKDD Explorations, Special Issue on Visual Analytics, 9:30-37, 2007. // M. Behrisch, J. Davey, S. Simon, T. Schreck, D. Keim, and J. Kohlhammer. // Visual comparison of orderings and rankings. In Proc. EuroVis Workshop on Visual Analytics, pages 7-11, 2013. // N. Silva, L. Shao, T. Schreck, E. Eggeling, and D. Fellner. Sense.me - open source framework for the exploration and visualization of eye tracking data. In Proc. IEEE Conference on Information Visualization.